I can’t say I am a diehard Roots fan (I have the album they recorded with John Legend … it’s very good), but what I have heard, I have liked. And I know that Questlove (Ahmir Thompson), the drummer and co-founder of the Roots, seems to often be at the center of musical circles and an insightful writer about culture from the hip-hop viewpoint. 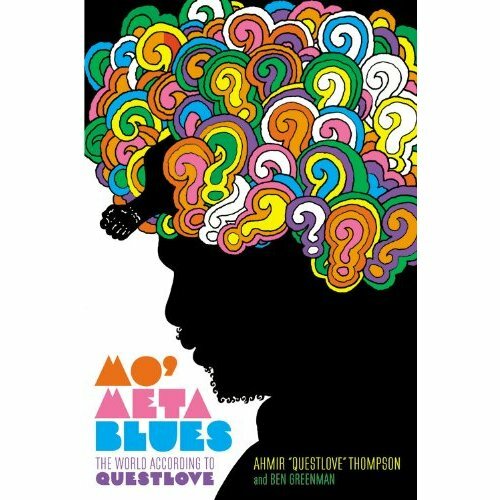 His memoir (a format he liberally plays with here) is called Mo’ Meta Blues, and it is a rich journey into more than just his personal history in music (The Roots are now Jimmy Fallon’s house band). It is also an insightful look into the history of hip-hop, with a Philly perspective, and of modern Black music and Black identity. I appreciate the humanity and humor Questlove brings to his story, and the way he shows us a band that often struggles to find an identity in the changing pop culture landscape and then keeps true to its heart and reforges its identity, time over time, and yet still clings to a vision of music as a powerful force in nature. They’re after bigger game than the next hit. It’s a bumpy ride for the Roots, and yet, they remain a viable force on many levels. I’ve been in and out of the Walk My World Project a bit this year, following when I can and adding when I find time and inspiration. The most recent Learning Event for Walk My World has participants exploring “turning points” in their life — a time when that metaphorical fork was there and you made a choice (or had a choice a made for you). I suppose Life is made up of these Turning Points, and all the “what ifs” that come with reflecting back. I chose a strange period in my life when the music in me went mostly silent. 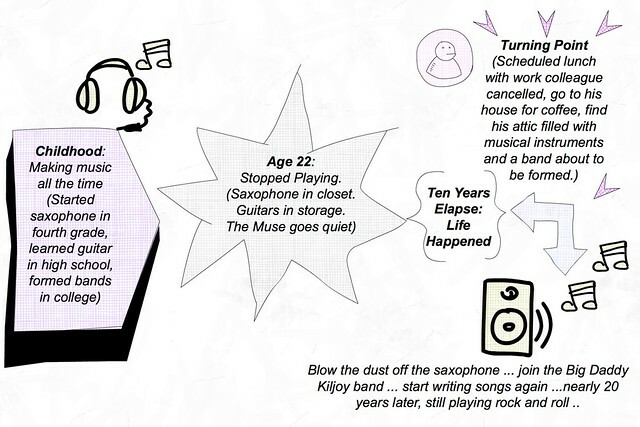 I had been playing my saxophone and guitar since childhood and teen years, but in my mid-20s, I packed them away. That was for about 10 years. I could probably point to all sorts of reasons, from the relationship I was in at the time, to the cramped apartment I was living in, to the confusion about the present and the future, to …. maybe I was just tired of music at that point. Maybe all of the above, with a little swirling action to stir the mix. What changed that — what became my turning point — was a chance lunch. A colleague at the newspaper where I was working as a journalist was leaving the office to become a self-employed editor, and before he left, I suggested we have lunch. On the day of our lunch, he wasn’t feeling great, but he invited me to his house for coffee. I agreed, and we were hanging out when he brought me up to his “office” in the attic. There, beyond his office area, was an attic full of musical instruments: guitars, bass, keyboard, amplifiers, drums. It was the outline of a band, and it turns out (unknown to either of us) that he was not only a musician, but he was also in the midst of starting a new band. When he found out I once played saxophone, he asked if I wanted to jam. The rest is history … I did jam and he and I and the drummer have now been playing in various bands for nearly 20 years (we’re in the midst of reforming yet another new band right now as our Duke Rushmore band fell apart last year). I am grateful for that particularly turning point, because it reminded me of what I loved about making music, and about writing songs, and about playing my saxophone, and about life, too, being more than work and family (though, of course, that is very important) and about having something just of your own. I’ll never be a professional musician — I not good enough nor am I dedicated enough, and I have long been at peace with that — but I can’t imagine life without it, either. It’s odd now to think of that ten year gap — as if it were another false life being lived at the time, as if I didn’t know who I was or what I was doing. Today, I am off to the University of Massachusetts to co-facilitate the first of three sessions around using the Library of Congress digital archives for primary sources for inquiry projects. This professional development course is a collaboration between our Western Massachusetts Writing Project and a local educational collaborative that does a lot of professional development. 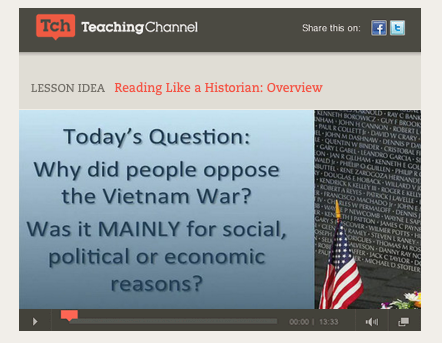 Our aim is to help teachers construct “text sets” of primary sources and develop questions and tasks that spark student inquiry and open-ended explorations. Since late December, I had been slowly sharing out thoughts from the new book by Henry Jenkins, Mimi Ito and danah boyd called Participatory Culture in a Networked Era. We chose the book as a slow-read after Digital Writing Month unofficial ended in November, hoping to continue the conversations and keep our own participatory elements alive and active. I’m not sure it all worked as we had hoped (this vision of multiple entry points with various conversations emerging and unfolding), but maybe it is too early to make that assessment. There was some activity here and there, and Terry Elliott offered up multiple entry points for folks to “participate” in the conversations. A few did. Some may be doing it still. Some may still enter in. It’s an open invitation. But I figure I needed an artificial ending point for myself with the book itself (and I wrote this post a few weeks ago but kept it in my draft bin), while still hoping to keep open the connections with other people reading it and learning from it, too. The last page of a book does not mean the last thoughts of a book. Much of what Jenkins, Ito and boyd talk about in Participatory Culture in a Networked Era rattle in my head. I am still hoping to find more people to talk about it with. Just “hearing” the discussions and debates and diving deeper by these three thinkers around Connected Learning and Participatory Culture is intriguing. The book is framed around main ideas, with an introduction by one of the three, and then edited transcripts as the three bandy about the ideas. I felt like I was in the room at times. By the end, they agree that the defining of Participatory Culture is still in flux. I still have troubles grasping a definition. It anchors on the ideas of people being to come together based on common interests, and creating ideas or things together, with experts helping novices. I feel like those ideas are important. I wish there had been more about classroom experiences, but these three are more researchers, and it seems as if much of their research has been done in out-of-school programs. This makes sense, as kids gather around interests in after-school programs or online spaces. But I keep coming back to the question of how to make sense of this in my classroom, and how to use Participatory Culture concepts to engage students in meaningful learning and literacy moments. The discussion around ways that commercial enterprises and corporate culture have sort of hijacked “participation” for financial gain and status in the world of Social Media is something that I appreciated, and certainly do talk about with my students. It’s about empowerment and filtering, and having agency to decide when to participate. The three authors have strong ideas, culled from their research. Talking about what kind of elements help nurture a Participatory Culture had us thinking of how technology platforms (Twitter, Google Plus, Facebook, etc.) either encourage or hinder Participatory Culture. Most of the sites I use on a regular basis seem less than ideal. There are pieces that invite participatory ideas, but there are also walls to a seamless experience. We found it interesting that our open invitations to discussions, of trying to create a small pocket of Participatory Culture around the reading of the book, didn’t seem to gather any reaction or comments from the three authors of the book. Maybe they didn’t even know we were talking about them. Or maybe they are keeping removed from the discussion around their book. Who knows? But it seemed counter to the theme of participation, of narrowing the line between reader and author. I still don’t get the cover art. I am not sure why I keep wondering about it. I guess I find it interesting and intriguing …. but it is strangely odd. This book is well worth your time, even if you don’t connect with discussions. I think it makes for a richer experience to read with others in online spaces, and explore and create, but the book is worth your time one way or another. Each year, my students invent new words as part of our Word Origins unit. 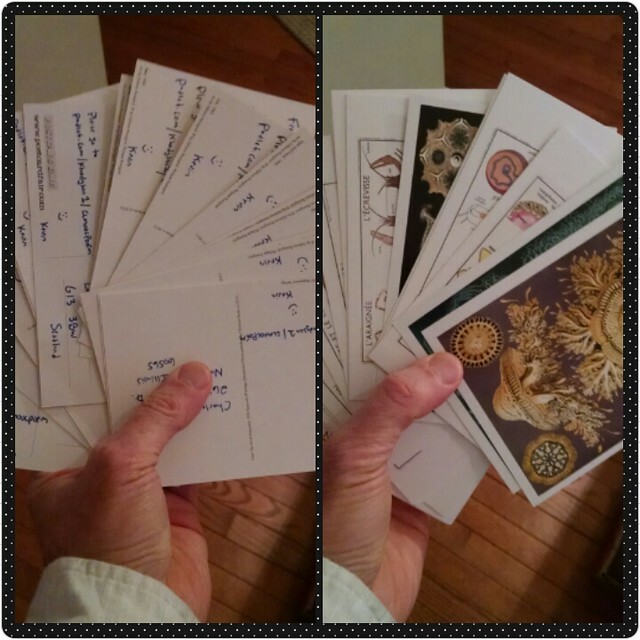 As we explore the many ways words come into the English Language (with a heavy emphasis on roots, prefix and suffix to support vocabulary acquisition), they invent some new words and then choose one of their words to donate. Yes, they donate their word to an ongoing endeavor called The Crazy Collaborative Dictionary Project. Now in its 11th year, and more than 800 words strong, the dictionary project collects invented words each year. I can’t believe we are still doing it but we are, and each year, the students are intrigued by the project. The word cloud above is the crop of words from this year’s classes that will be added to the dictionary in the coming week or two. Students also record themselves, saying their words and definitions, so that their voice becomes part of the dictionary project. Frindle: Words from Mr. Hodgson on Vimeo. A neighbor passed along a book about youth sports to my son, telling him to give the book to me. 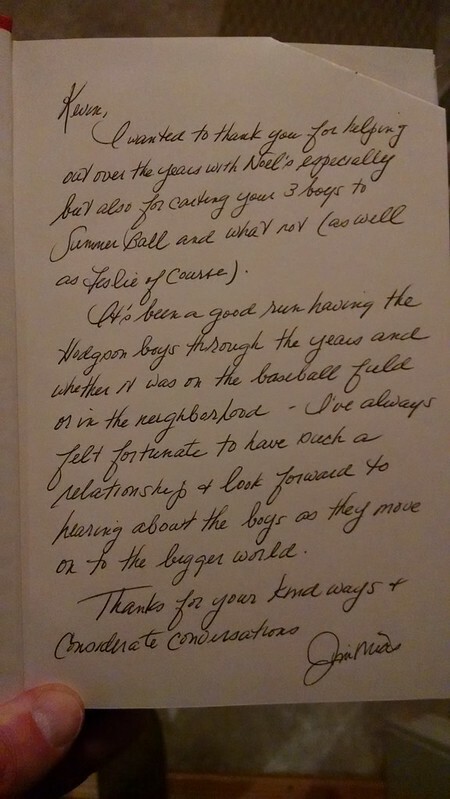 When I finally opened up the inside of the book, there was this beautiful note from my neighbor, a friend who has coached my sons in youth baseball over the years. We’re at a point in our lives where my youngest is now too old to play in the level that he coaches. We’ve had many conversations over the years about teaching, about books (he is retired but worked in the library of the local VA Hospital), about kids growing up over the years, about technology for good and for ill, and about politics and more. I was struck by the kind words that he wrote and also about how the physical writing (and in a book, to boot) has a certain emotional power that an email would not have had. This friend doesn’t like technology all that much, and uses computers at the library when he needs to do anything with computers, so it is no surprise that he would handwrite out the note. Still … his note reminds me of our ongoing CLMOOC Postcard Project, where a handful of people are sending out postcards now and then to each other. Seeing words that have been written on the page by hand, as opposed to typed on the screen by fingers, still holds an allure, particularly when there is a human connection from reader to writer. 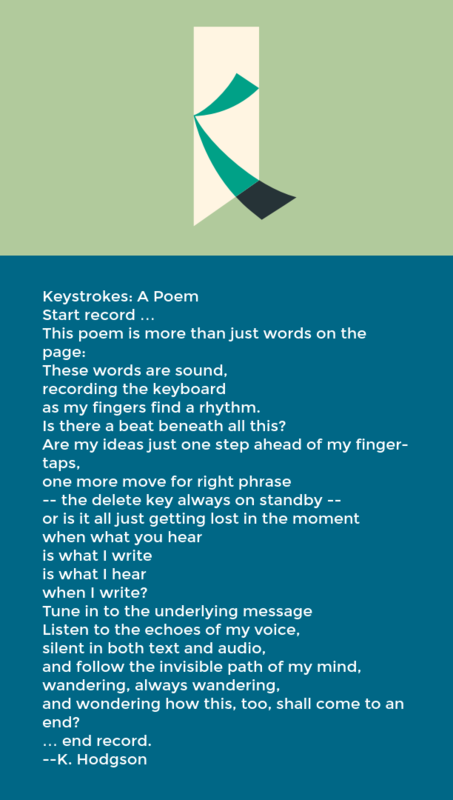 Yesterday, I shared out a bit about the twists and turns of a poetry project that involved friends from around the world, postcards sent and found and lost, and an original poem that I had broken apart and parsed out, with an invitation to friends to reconstruct the words and phrases on a digital wall. Today, I wanted to find a way to share out the original poem, particularly now that we have opened up the wall and others are jumping in, adding words and media and more. The poem is receding in that space as collaborative sharing surfaces. I love that movement, but I still want to keep the original poem intact. The video above is that poem, told as digital poem, and with a bit of App Smashing on the iPad, too. I used the Legend app to make the animated text pieces (with background images as screenshots of the wall), and then I moved those short videos into the iMovie app to create a single video. Meanwhile, the guitar music is a piece that I wrote and recorded with the new Music Memo app the other night, mixed in the Garageband app, and then moved onto the iMovie app as soundtrack. From there, I uploaded the video into YouTube. Phew. It seems like a lot to juggle but it all worked rather seamlessly to create what I had in mind. Come add what you want to the poetry wall. We’ve opened up the poem to the winds of chance. There is a great scene in the wonderful picture book, Weslandia by Paul Fleischman, in which Wesley, the outcast boy who decides to build a new civilization for summer vacation break, has an argument of sorts with an adult neighbor. Wesley has been prepping a garden, and the neighbor tells him to plant tomatoes, Brussel Sprouts and other common crops. Instead, Wesley looks towards the unexpected, and makes room for it. He decides to leave it to the winds to decide what will grow, and one night, a magical wind of chance does come a-blowing, scattering strange unknown seeds in Wesley’s plot of ground that become the flowering plants that will transform the backyard into the civilization that Wesley calls Weslandia. The neighbor tells Wesley that if he doesn’t watch out, he will have trouble with the sprouts. “You’ll have almighty bedlam on your hands if you don’t get those weeds out,” warned his neighbor. Nearly eight weeks later, a few postcards are still arriving (some of the postcards went to other parts of the world.) Some postcards never made it. Some may have been forgotten or ignored. 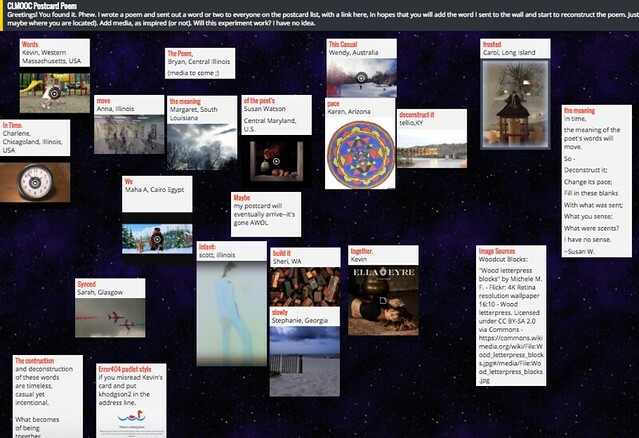 But the Padlet wall where the poem is being reconstructed? It’s pretty cool. While waiting for the postcards to be delivered, I had also started up a Twitter Messaging forum with the folks I sent the postcards to. Originally, I had just intended to “warn” them about the postcard on the way (my handwriting stinks so if they could not read it, I wanted a way for them to reach out). That string of messages in the Twitter backchannel has become a very interesting space over the past eight weeks or so, as conversations have turned on the project, on the use of traditional mail for a connected learning project, of patience and perseverance, of global connections, and of the nature of “chance” in an open environment. I feel more connected with that conversation that I have with the poem itself, interestingly enough. And then something interesting happened … one of my friends shared the link to the poem project in a blog post about process of writing (which I think is cool to think of it all as a process of writing and collaboration over time) and one of their readers, another friend of mine outside of the postcard project but in other networks, went and left a piece of media and their own new word on the poem wall. Suddenly, the poem was becoming something new, moving out of my hands in an intriguing way. So, while I have not yet come to a point of writing about my intent as the first writer behind the Postcard Poetry Project (since the poem is not yet completely reconstructed .. this post is not the reflective post I still intend to write someday), I want to open the whole poem itself to the Winds of Chance, as Wesley did when he was beginning his summer civilization project, and I want to invite you (and you and you) to come into the Padlet wall, and maybe add a word and a piece of media. What shared writing can we create together? What will the winds bring? Come add to the poem. We will write this next phase of the project together. Wesley would be proud.